Editor’s Note: This resource has been updated and revised for 2018. My love affair with paracord continues. Not only is it strong and useful for a myriad of tasks, it is colorful and fun to work with. Time spent making a paracord bracelet, paracord lanyard, paracord belt, and other paracord projects is time well spent. I know I am not the only one that feels this way. Simply enter the term “paracord” into a search engine and you will be presented with thousands of articles covering everything cool paracord projects, as well as from what paracord is, how to use paracord, where to buy it, and more. It seems like everyone has a stake in the paracord love-fest with preppers leading the pack! 1 What Exactly is Paracord? 2 What makes paracord different from other cords? 6 Deciding what to do with paracord first is the hard part! Paracord is a lightweight nylon rope that was originally used in the suspension lines of US parachutes during World War II– hence its name; a blend of parachute cord. Soldiers, however, found that this miracle rope was useful for far more than their paratrooper missions. In the ensuing years, both the military and civilians alike have found hundreds if not thousands of uses for paracord. By the way, you will often see paracord referred to as Paracord 550 or type iii paracord means that it has a breaking strength of 550 pounds or more. Now that is strong! There are different types of paracord, but Paracod 550 is the prefered type for paracord projects. I touched upon a number of uses in the description above but that was merely a sampling. There is more – a lot more. Today I share 60+ different uses of paracord for prepping and survival purposes. Paracord is something that every prepper, outdoors person, camper, etc. should have! From SHTF scenarios to craft projects and everyday home needs, paracord is there for you. What makes paracord different from other cords? Paracord was originally developed for suspension lines for parachutes. True paracord has a nylon sheath with multiple inner strands inside. This design is how it has such a superior strength to weight ratio. Quality paracord has a strength rating of 550 lbs or more. This is also called the breaking strength. This makes it an excellent value for your money. Since it is made from nylon it does not rot and holds up to weather quite well! Paracord is more than just a parachute cord. Here are 60+ things you can use this amazing stuff for! I can tell you right now that there are more uses than can be fit in a whole series of posts but this list is a good start! 1. Securing a tent against the wind or other inclement weather is easier with paracord. Simply tie off from your tent stakes, poles, or other points for increased strength. You can also use this to stretch a tarp over your tent for increased shelter and protection. Ever feel like you don’t have enough hands? Well paracord can help you out by allowing you to tie tools to your belt for easy access or simply to prevent loss when moving from Point A to Point B when in a survival situation. While most people prefer the paracord bracelet, you can create a paracord necklace to carry tools around your neck. Pocket knives are a good example of a tool that is easy to carry with a paracord necklace. When I was a little girl I carried my lockback folder on a cord so I could get to it when I needed it and not worry about losing it out of my pocket or I could wear it while wearing a dress! Backpacks don’t always have attachment points and straps where you want them. Paracord is easy to tie and secures items to your pack. This is even good for securing items that are already attached but that you want to be extra sure that you do not lose. Be sure to brush up on your knots beforehand! A tourniquet can save your life or that of someone close to you. In an emergency or survival situation, paracord is more than tough enough to use for a tourniquet that can be sized to fit anyone with ease. Breaks and sprains are some of the most common injuries. A good straight stick can be used to make a splint and paracord can then be used to hold it in place, especially when doing so means your survival. Slings can be good for adding extra support to injured arms. While a few doubled up lengths of paracord can make a big difference you can also braid, cobra weave, or macrame it to make it more solid and stronger. If at a later time you need to use the paracord you can always unravel it. You can get pretty darn creative with paracord, case in point with paracord belts. There are all kinds of fancy knots, designs, and braids you can utilize to make custom sized or adjustable belts, the cobra knot and cobra weave being the most common. One thing you can be sure of is that your belt is going to be super strong and durable if you make it out of paracord. During a survival situation, having a belt that you can adjust may be quite useful because it is possible that a lot of people will be losing weight due to increased activity levels and less access to extra food and calories. While you may not be able to get extra clothes you can make do with what you have more easily with a good paracord belt. Suspenders are an alternative to a paracord belt and is an easy diy paracord task if you are on the go. Good support is important for us ladies. You can definitely use paracord to repair a bra strap and I have to say you can use paracord and a little fabric to make a very supportive and long lasting bra that is custom sized for you. Dress straps made out of paracord look pretty snazzy and edgy at the same time. A lot of us have put back some bootlaces. I know that when I can catch the Outdoor Grade Kiwi shoelaces in the 72 inch length for $1 instead of $2-$3 I buy a few packs and stash them back. Paracord has the advantage of being multi-purpose and you can customize the size easily for all sizes of boots and shoes. Use a lighter to melt the cut ends enough to fuse them together so laces do not unravel on the ends. Who hasn’t tore or worn a zipper pull out? This situation is easy to fix with a very small loop of paracord. While I would not use just a single piece of paracord for this, you could double it up, loop around, or tie off from multiple points to secure your watercraft as you would with a rope. Braided paracord could also work. Larger boats are not going to stay tied with paracord so use some common sense. It would take a lot of paracord woven together to even try to do this, so just keep things simple and use a rope. Paracord lanyards are great for a variety of things. You can attach them to knife or make a fashionable survival necklace with a charm. Paracord keychain lanyards will help you keep track of your keys or you could even keep ID attached at work. There are a lot of expensive clotheslines you can buy or you can just use some paracord to string a line wherever needed. You can definitely double up the line if you have a lot of wet clothes. The weight of a single load of clothes can be quite a bit, especially if you are having to wring them out by hand and without a clothes wringer. Tie the ends to something sturdy and use secure knots to keep everything in place. Paracord could be used for a small tow line but again use some common sense and use a rope if in doubt. The more you double or triple it up the more strong it will be but watch out towing for a long length of time because wear from friction might be the weak point depending on what you are doing. There are a lot of things that you might want to hang up from pictures to making a toy for your cat to paw at instead of shredding your stuff. My husband sometimes has to remind me to work smart not hard. This means using tools and leverage to decrease workload and strain on your back! A pulley system can be a major help. Just make sure to calculate your load and account for friction that can occur on your line, watch out for knots and fraying at the ends. Paracord is a bit thick for traps and snares because animals can see it but if you can manage to conceal it somewhat, you could use it in a pinch. Be careful where you step if you are new to trapping. When it comes to closing up a bag, replacing the drawstring on pants, hats, coats, etc. paracord is a tough solution that will last. Some of you may have read my article on perimeter security, well paracord can also be used to secure areas. There are a lot of booby traps you can make but you should probably not use them unless absolutely necessary because they can actually be deadly. Watch where you step when creating these. I will leave it up to you to find the info on how to make these. The internet is full of them. I will say that you can use paracord to hang fish hooks off of for a barricade if you want something a bit less tangly then fishing line. Green paracord blends in well. Rolling up items for packing or storing can be a big help but it can also be frustrating when they come unrolled so easily. Paracord can be used to tie up items to keep them more compact and secure. Having a lot of loose items can be a real burden. Tying items together can make it much easier to transport. For example you could tie a sleeping bag, camping mattress, and pillow together. 23. Make very strong rot proof rope. While technically you might consider paracord a rope in itself, when braided or knotted in various ways it can be made to be extremely sturdy and able to support very high weight loads. The knotting and braiding effect also makes it less likely to break just because it is harder for the cords to separate under loads and gives you more time to react if a breakage starts to happen. Sometimes rope is the better option, but this is a cool paracord use that you can try. While it would take an extreme amount of complicated knots to make an entire hammock out of paracord, you could definitely use some fabric like a few blankets and some paracord to make a hammock a bit faster. Be sure to loop the paracord around the tree a few times to ensure it’s secure. You could also use a larger rope attached to your paracord to loop around for added protection. Paracord could make a decent fishing net if you took the time to make into a webbed network. Size of the net and the size of the spaces that form the webbing is upu and the size of the fish you are trying for. Smaller gives you the chance of a greater variety but takes more time to make. Again, the webbing and knots are extensive to make a bag out of just paracord but you can combine with fabric to put together a bag rather quickly even if just sewing and tying by hand. The cobra weave makes for a great, comfortable handle. 27. Bundle plants and herbs for drying. Gardeners often have the need to bundle and dry herbs, garlic, etc. Paracord is strong and it doesn’t rot or absorb water readily. Simply loop the paracord around the bundle and use the excess to hang from the ceiling. Paracord is useful for tying trees and other plants to stakes for support but it doesn’t rot so you will have to go back and remove or cut the paracord at some point unlike with jute and other twines that rot over time. On the other hand, paracord is much stronger than jute and other garden twines so if you have a big job, it might not be a bad idea. Simply loop the cord around the plants and posts and tie a knot to get the job done. If you have priced out dog leashes and animal leads then you might have come to the conclusion that a good one is priced fairly high. A paracord dog leash is very strong and can be quite pretty when made with macrame or braiding. Another item that is often needed are collars. Dogs, cats, and livestock can go through a lot of them over the years due to wear and tear and also from growing. You can make a cute custom paracord dog collar and even add adornments if you like. Tie rain gear or a garbage bag around yourself for protection from the rain and other inclement weather. Simply loop around yourself and tie a knot to secure. There are times when provisions need some extra protection from bears and other creatures. Paracord is great for making a bear hang. Tie a rock securely to the end and loop over a sturdy branch. Make sure to exercise some caution since rocks can fly off the end sometimes if not attached very well or if you sling then really hard. Be sure to brush up on your knots before attempting this. Tying down things to protect them during storms, flooding, and other weather can save you a lot of losses and frustration. Paracord can be doubled or tripled up for additional strength. A single line may not be enough for extremely high winds or large objects, especially those that are big yet lightweight. You may also want to look at different types of paracord to use, depending on your location. There are a lot of situations where a trip wire might come in handy. For starters, they can help slow down trespassers during a SHTF scenario. As far as paracord survival tools go, this paracord project is less harmful than setting booby traps, but still an effective security measure. If you have to restrain someone lightly you can use paracord to make handcuffs that can be hard to get out of this brings us to another use…..
36. Tying up intruders or bad guys during a survival scenario or other bad situation. Tying to a chair or tree may actually be appropriate if the survival situation is scary enough. I have some Native American in my background and one thing some used to do was tie a bad guy or enemy to a tree and smear honey on them to attract stinging insects and bears. Not nice, but desperate times can sometimes call for desperate measures, especially back in the old days. Under low visibility, harsh conditions, or in a group of people of mixed outdoor abilities, tying everyone to the same line can help everyone stay together and improve your chances of survival in a dangerous situation. Different types of paracord come in many different colors and you can make it into various knots and patterns that can be useful for identifying and organizing just about anything. Inner threads can be used for sewing thread although it can be time-consuming to undo paracord if you need a lot of thread. For small sewing repairs though it is pretty easy to get enough to sew a button on or repair a tear, sew on a patch, etc. The inner threads are a bit thick but they may be useful for some if dental floss is needed or you need to clean out a crevice and can get a thread through to the other side. While I would not recommend using this unless you are in very dire circumstances,–like a survival scenario– inner threads could be used to sew up a wound but the downside to this is these stitches would have to be removed later since paracord does not really break down. There is also the fact that stitches are something that should only be done within the first hour or so a wound is created. Blood stop powder and butterfly closures or Steri Strips are usually much better for a wound. Paracord is not in any way sterile either but I suppose you could sterilize it by soaking in antiseptic first. Some of you may remember the macrame plant holders that were common in the 70s and 80s. You can make a neat plant hanger and holder out of paracord by using macrame techniques. Paracord is excellent for bartering with during hard times and SHTF scenarios. It is very inexpensive but invaluable due to its versatility. I got a really good deal once at Camping Survival on paracord in a variety of colors. It was less than half the price of buying by the spool. It came in 100 ft sections individually packaged so it was easy to stash some in the truck, put some back, and have some around for just crafts and general household use. I know that I have enough to trade a little if needed! Paracord can be used to attach logs together to make something that could be used to float yourself and gear or even just help you out with taking gear across some water. It might take a lot of paracord to do this and ensure sturdiness but it could be done. Alternatively, if you have a rope to loop around it may be a better option. The inner threads can be used for fishing line. Some fish like trout can be hard to catch with really thick line so the fine inner threads would work better than trying to use the whole cord. Of course not everyone lives where fish are small use your judgment call as to what test of line you will need. You can always use multiple threads if needed or make a paracord jig. While it may not last long in some applications, paracord can be used to replace those pull start cords that are prone to breakage over time. Lawnmowers, boats, small 2 wheel tractors, and more can be made to run again. This can get you out of a tight spot if your out on the water and you go to start your engine and it doesn’t run. Also what if you are running your tiller or tractor out in a far field and need to get it back into the barn? 47.Wrap a knife, baseball bat, or machete handle for a non slip grip! Some weapons and tools need some help in the grip department. You can use paracord to tightly wrap a handle for a long-lasting non-slip grip. Use a little more paracord to make a lanyard if there is a spot to attach it to a knife or machete. Having a paracord knife handle/ paracord knife is a great way to keep your weapon in reach. For baseball bats used for home defense, paracord is going to last longer than tape. My Grandma swore by her ball bat kept in her room! Some chairs have “canes” or woven seats as a base. You can use paracord to repair or even weave it to replace a seat if necessary. When used in sufficient quantity and knotted correctly you can use paracord to provide support under a traditional bed. In fact, you may learn that you prefer it over hard wooden slats! Make sure the frame is sturdy enough to support the loop of paracord. My husband is always pointing out that I shed hair ties like crazy! Paracord is inexpensive compared to buying hair ties. You can also make some decorative hair ties and bands for a fancier touch. At the bare minimum, you at least have something to keep hair pulled back when working. Just because SHTF doesn’t mean I want to cut my hair off! You can tie knots in paracord and pull it through smaller hoses to clean them a little bit easier and definitely more thoroughly than just soaking. I wish I had known about this years ago! Paracord can definitely give someone something to hold onto so they can be pulled to safety. Having something to hang onto can also help them be able to climb some and take the strain off of rescuers that may be hurt or exhausted themselves! If you have a 100 ft or 50 ft section of paracord you can use it to measure distances which can be very helpful. There are times that a tape measure is just not available. Planning a project like a building or a bunker for stashing supplies is more complicated than you might think. As someone that helped build a house, I have to say that squaring up a building site or foundation is not as easy as one might think. Paracord ran between stakes helps you to get a better idea of what you are doing and reduces labor because you start out your site in the right place. If you need to tie down solar panels then you can use some paracord to tie them off to something nearby, lash to a fence post you put in the ground, or you can use tent stakes or similar to create a tie-down point. This is a great way to secure panels short term. Over time even paracord will wear out when exposed to weather so longer term you will need to replace it with something else or just occasionally replace it with a fresh cord. Paracord is plenty strong enough to solve your lighting needs. You would not want to do this with an oil lantern for obvious safety reasons but for your average prepper with solar or battery powered lights, paracord is all the hanger they will need for a variety of situations. I know that not everyone wears a watch now but for those that do the paracord watch version can be assured that their watch band is going to hold up. Your paracord watchband might also come in handy during a survival situation. Paracord makes a stout catapult or slingshot that you can use to hurl things about. You can tie knots and run the cord through soaked in bore cleaner to clean your rifle if you don’t have a bore cleaner brush. The beauty of this is that you can tie the knots to match the size of any of your bores so you don’t have to worry about having several sizes of rods or bore cleaner tips during an emergency, A gun cleaning kit is always nice and ideal but it sure is good to know how to clean a gun when you are not under ideal circumstances. As a bonus, you can make a paracord rifle sling to keep on hand for this purpose. Small animals can have their legs tied apart and hung from a branch for easier gutting and cleaning. This allows you to use gravity to make innards fall to the ground or a waiting container. Keep in mind that very heavy animals can be dangerous to hand over you if you don’t use something strong enough. Paracord would work okay for animals under 200 if doubled up. Create slits between the bone and the back tendon and pull doubled up paracord through to loop over a branch. Use rope if the animal is too heavy. An important part of the hide tanning process is stretching the hide. To do this you need to have sturdy cord or string to run through outside points and stretch the hide on a drying frame. This also helps when thinning hides down. As the hide dries and becomes smaller you need a cord that can be adjusted. Paracord doesn’t hold moisture readily and if you leave it nice and long you can increase the length as the hide stretches more towards the center of your tanning frame. Use paracord to tie a knife or other sharp point to a stick. An old broom handle or anything like that will work just fine! The straighter the better. I don’t want to have to choke someone but if it came down to it paracord would do the job just fine. When it comes down to you or them sometimes you got to improvise when it comes to survival. There are a ton of useful knots that can help you out in a pinch but you need to practice them beforehand! There are some great books on knot tying out there and paracord is great stuff for learning how to tie knots. Plus since you are going to be using paracord or will have it on hand, it is good to practice with what you are going to be using for rope and such so you can experiment with what knots seem to work best for you. 65. Make A Weapon: ENTER THE PREPPER MACE! Knot paracord around a medium to large rock and then braid a handle that is long enough that you can sling it around with ease. This is a makeshift weapon that is super cheap to make and can definitely give you some advantages in hand to hand combat situations. Make sure your knots are secure before unleashing the weapon! Dig a hole and use some sticks as anchor points down in the mouth. Create a web of paracord that can support leaves or other ground cover to make it look like the rest of the surroundings. Just make sure to watch your step so you don’t forget about it and fall in yourself! Pit traps can be good perimeter security for SHTF but make sure all those you care about stay well away, especially kids and such. There are different types of paracord thatcomes in different lengths. Buying paracord in a giant spool is often the most economical way to get it but sometimes you can get a real bargain on precut lengths. The advantages of the smaller lengths is that they are packaged and ready for trade or barter and you can place them strategically around your home, office, business, or vehicle. Of course OD green is the most popular and common color but paracord also comes in a lot of other shades that can be useful in different situations. Khaki colored cord or black cord is useful to have because it can blend into places that OD green cannot. For crafts, there are some different colors like Starry Night. You can also use several colors to blend together to make tactical bracelets and other fun things. If you are willing to not be picky about color, you can sometimes get paracord for half price or less. If you want outrageous paracord colors for crafts and projects then no worries because there are companies that sell over 400 colors and patterns. Since so many people have discovered how to use paracord, manufacturers have stepped up to the plate to provide a huge selection that makes it more appealing to a broader customer base. I would recommend getting a large spool of paracord in OD green as a base stash over other cordage. You can always cut some off for trade and store in zip ocs. This can be a good way to do it so you have it where you need it around your place or in your vehicle. Just remember to use a lighter to lightly heat and seal the ends to prevent unwanted fraying. 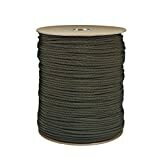 Paracord Planet sells on Amazon and offers 1,000 ft spools at a good price and in a huge selection of colors. If you have Prime they will get it to you in 2 days. Ordering smaller lengths means you are paying double the cost of what you pay if you get paracord in a 1,000 ft spool but it can allow you to have more colors without committing to a huge roll. Deciding what to do with paracord first is the hard part! If you have made it to the end of the post you might be having trouble deciding what to do first with paracord. I recommend cutting a length and practice tying some different knots to get a feel for it and to stash some in your vehicle and bug out bag. Do you have some paracord uses to add or any stories about how it got you out of a situation? How about tips on using it that have not been addressed above? Please comment below! I’m getting pretty good with making a lasso with paracord to catch one of my goats that keep getting gout. No my goat doesn’t have gout, she gets “out”. I bought some 550 paracord and a lighter one at Wallyworld. I’ve use the lighter cord for many things while working outside. I’ve tied cut brush together so I could move it in one go, tied brush and trash on the back of my Kawasaki Mule, tied firewood in the bed of my pickup, used it to tension a fence where I was putting in a gate. I haven’t had to tie anyone up, yet, but it should hold the bad guys with no problem! I don’t know where I would use the extra strength of the 550, but I’m sure I’ll need it someday! I actually need to try this 1st, (On my list). Paracord for use to climb up or down is next to impossible due to it’s size. I have thought of tying a large zip tie at intervals for foot and hand holds. These would need to be the large commercial type not the cheap ones we commonly use around the house. Has anyone else already tried this? Your flashlight obsession really helped this past winter because I picked up a bunch as Christmas gifts & we used them during our ice storm/blackout. So now I need to get some paracord for a few projects. Another obsession is whistles. I must have at least a dozen of various types. Suggestion – For those that have whistles, (Which should be everyone). Have several pairs of ear plugs with the cord attaching the two. put them around your neck. If you are ever trapped somewhere, you will want them when you blow your whistle. I guess my ears aren’t that sensitive. Loud sounds have ruined them, I suppose. Definitely would want earplugs on a leash for this. Ha! I have two whistles I’m thinking of selling. One is a WWII miltary whistle, the other is a regular run of the mill metal whistle you don’t (or, at least, I don’t) see too often these days. I’m having a pang of wanting to get rid of a whole lotta stuff I’ve scrounged for when SHTF. I feel like I’ve got waayy too much Stuff. I read about somebody facing a storm or something and their husband couldn’t find an item when they needed it. I wrote out a list of what I wanted to sell off, and showed it to The better half. She wrote the word, “No!” alot on my list… with a threat of, there will be consequences if I sell her stuff! What’s a prepper to do? … If Only I had a chicken coup with a basement. In the background, the song, “Going Mobile” is playing. We do have a few whistles. You can definitely tell the difference. I used to work as an aide at a school & all of us would compare our whistles. (We blew them to have the kids line up) I swear by the nice metal ones you can get in the sporting goods section made for coaches/referees. Oh, I forgot to mention, the whole reason I was commenting. I’m not for sure, I haven’t tried it, but it seems to me (as a former river rat) the whole thread of the paracord would be great for didy-poles or running a trot line. Jug fishing, too. All of those are survival uses, imho. Quite effective, and lets you be, ‘under the wire’, so to speak. I only wished that stuff was available to me when I was a young person, I’m certain I could give you ten extra uses for it. That stuff is great. This is a great article, Gaye! Thank you for posting it!! Paracord is awesome stuff, to be sure. There are thousands of possible uses for it. You can even use the inner threads to remove a wedding ring stuck on a swollen finger. Start with a 6 foot long piece. Feed about two feet of thread under the stuck ring, leaving about four feet hanging down from the finger-side of the ring. Tightly wind the the four foot section around the finger below the ring. Keep winding until you cover the knuckle. This should help reduce some of the swelling. Then pull the two foot end (palm side) of the thread to “unwind” the ring off of the finger. It’s a trick they do in ERs all around the world. I’ve seen it work with dental floss, and the elastic strap to an oxygen mask. I’ve written an article describing this trick, with a few videos showing it in action (and an “epic fail” video of how NOT to do it! lol). And there’s another article showing how to make a paracord rock sling for hunting small game. They’re both on my site. Please stop by and say hello, Gaye! I have seen the inner cords tied together to form netting. Tie the netting over a sappling formed into a circle and you have an effective dip net. Of course there are countless other uses for netting. I tie up 25 foot lengths of paracord 550 in what is called a ‘reusable rapid release’ bundle. This allows me to keep several of these available and they don’t get all tangled. Once I have used one, it’s a simple matter to tie it back into its rapid release format. I’ve found sgtknots to be all around the best prices on paracord etc. in all manner of lengths. To make the bundle, take a 25 ft length. Tie a small bowline loop at one end. Spread the fingers of one hand wide apart. Put the loop over thumb OR little finger. Then loop back and forth between thumb and little finger. Make the loops in a figure eight pattern. When you have about 5 feet left, slip the bundle off your hand. Then wrap the remaining cord around it like you see a clothesline when you buy one. Slip the free end under a last loop to secure it. To use, loosen the free end and pull the loop end. It will unravel quite nicely. There are a lot of different kinds of para cord out there. I would recommend true military grade 550 para cord made in the USA. There should be six or seven inner white strings and one black and white twisted string. Other types are not as strong and could be unsafe when used for stress situations. There is an interesting video of how paracord is actually made in the link below. The machines appear to be amazing pieces of engineering and mesmerizing to watch!. While not an emergency use, I find paracord useful in my gardening. I grow tomatoes on my deck in 5-gallo buckets. I put six on the top of a picnic table, 3 on the bench and 3 on the deck… total 12. I had a problem once with strong winds blowing over the buckets on the top of the table. So I looped a 25 ft length of paracord around a bucket and secured it to the raiing, then continued to the next bucket. I ended up using about 50 ft. and have not had the tomatoes blown over since. I also use 30 inch lengths to help support the vines when the tomatoes cause them to start drooping. I tie them to the tomato cage. In the fall I take the ties and soak them in some soapy water to remove the tomato ‘flavor’ and hang them in the garage to dry. Then I stash them in a gallon milk jug until next year. YAY for paracord! Duane – I have been using “your” method of making a coil of paracord. My little bundles look like small clotheslines :). I really need to share it on the Buzz! These item can be use by rescuers, if they are going to rescue people that are trap in the flood. Thank you for your effort on putting all these these together. It was very helpful. Or, you could use dental floss for dental floss, and fishing line for fishing line. Proper climbing rope for climbing, and string for string. Macremed bracelets of paracord are cute, but if the line between life and death is or ever will be a bracelet of pink or camo cord, well …? There are real tools that solve real problems, and pretending that a few hundred feet, or a bracelet, of paracord will replace proper tools is a joke. I guess what you’ll need in an emergency all depends on your perspective, lol. So I waited to throw this one out. In the 80’s the Marine Corps taught us to make a Swiss seat for repelling. Mind you, it must be doubled up and it hurts like any Swiss Seat but in a pinch I will take the wedgie and the pinching of the bits if I had to do it. Same thing works for the actual repelling but not advised and make sure your gloves have thick palms. I did the Swiss seat but passed on the 50′ repel. “Trust your equipment” only goes so far. I love making paracord projects. Recently I followed an Paracord Lanyard Tutorial to make a Neck Lanyard for my hiking. I found the patterns very helpful. Strike 41. Do not use paracord for sutures (stitches)! First off, it’s not sterile, and you aren’t going to make it so. Second, the braid will cause capillary action, saturating the line with (bodily) fluids. You are gonna get it infected, no doubt. Third, it is much bigger diameter than proper sutures; so’s anything you’d use as a needle. Bigger hole = more pain. Use steri-strips, or if they are illegal to be sold in your state (looking at you, Wisconsin) improvise them from duct tape. 53. If accuracy counts for anything, don’t use paracord for anything other than very approximate distances. It stretches, don’t you know?